Looking at the photo below, you'll see that our weather is far from tropical. We can pretend that is white sand ;-) Made a quick trip to Hobby Lobby and Aldi's for a few palms and hosted a Key West themed dinner for our family last weekend. 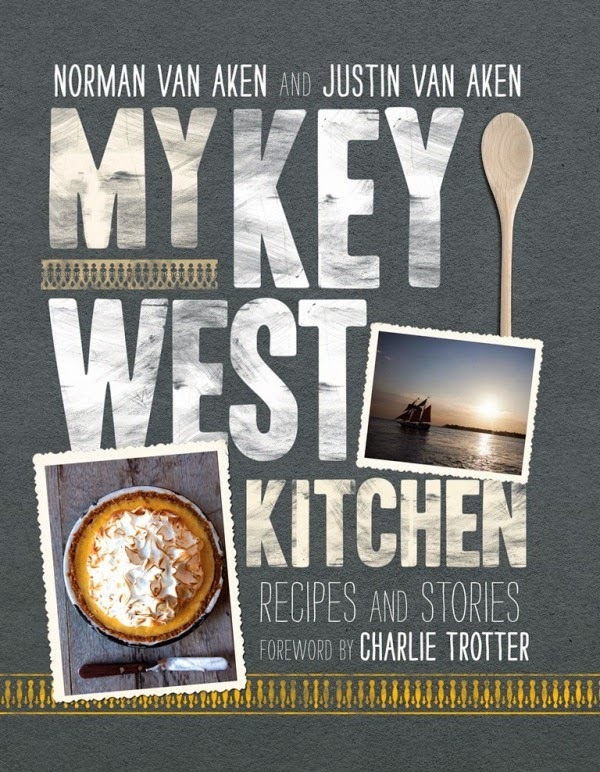 We've been wanting to do this since returning from Key West last February, and chose several menu items from the cookbook "My Key West Kitchen". The menu consisted of several dishes from the cookbook I picked up in Key West and others I found on the internet after doing some extensive research and reading reviews. I love reviews and they were spot on. Combine the vanilla vodka, key lime liqueur, pineapple juice, and cream in a shaker. Fill the shaker half full with ice and shake until well blended. Pour into prepared martini glass, garnish with a lime wedge and serve immediately. The weather, architecture, food, music and flowers blooming in the full moon light, especially in February for me. 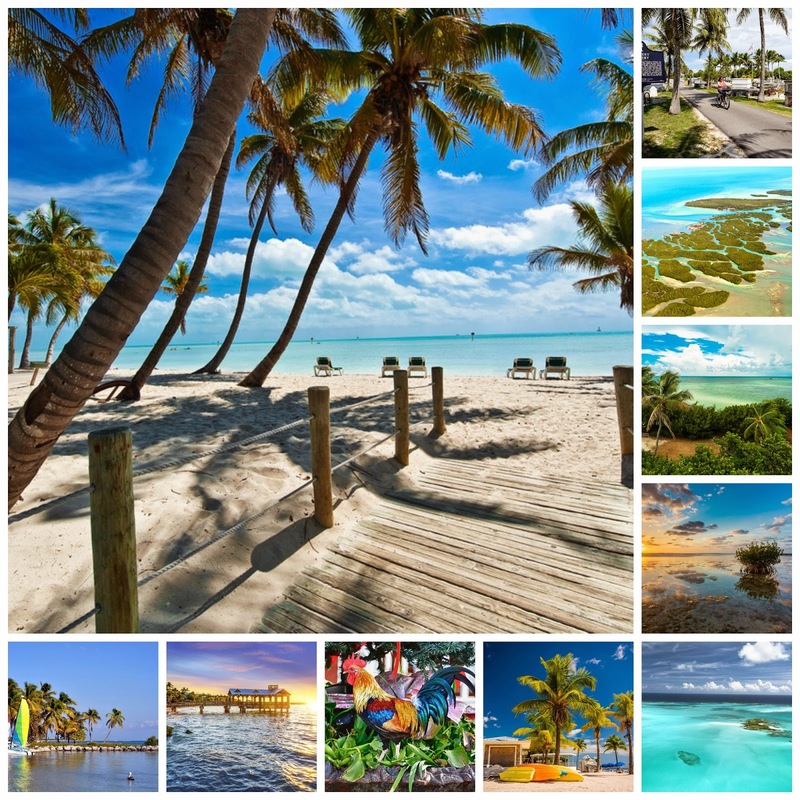 And for anybody else that wants it ;-) Key West lies 150 miles south of Miami and 90 miles north of Cuba. This little spit of land, four miles long by two miles wide, hosts weather that is consistently beautiful thanks to its subtropical climate, with temperatures of seventy-five to eighty degrees year round. 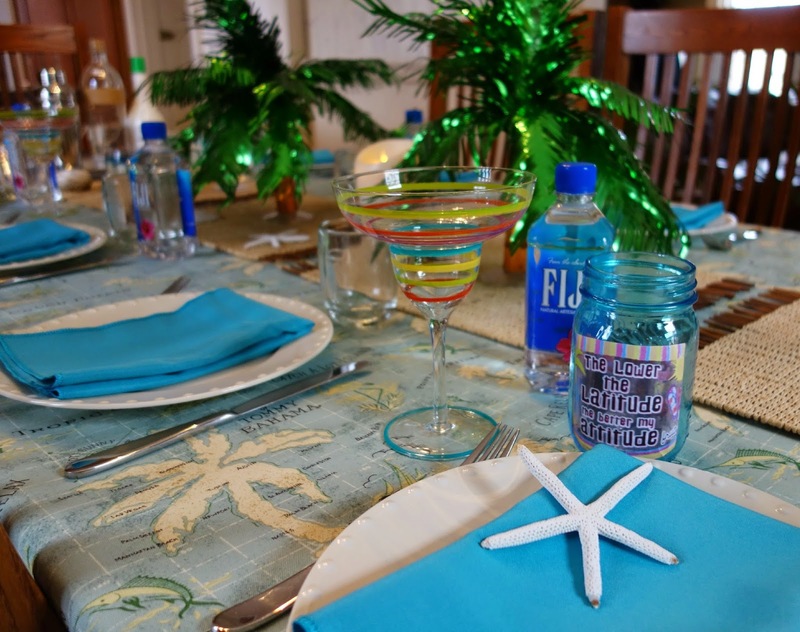 Leslie Linsley "A Tropical Lifestyle"
A Tommy Bahama tablecloth from the Christmas Tree Shoppe, margarita glasses, tea light candles in blue mason jars with a label I printed from the computer, star fish, sea shells, mini palm trees from Hobby Lobby and bottles of Fiji water. Several items on our menu were gluten free including these tasty crispy coconut shrimp. They were a bit hit served with homemade pineapple salsa. One of our entrees was an eight-bone rack of pork prepared Key West Style. The rub was made with olive oil, black peppercorns (bruised), Old Bay seasoning, garlic and red onion. The glaze was olive oil, butter, garlic, sweet onion, orange, toasted cumin seeds, sherry wine vinegar and orange marmalade. Our second entree was Oven-Roasted Mojo Chicken that was marinated overnight in Sour Orange Mojo (a class Latin-American sauce) which consisted of garlic, Scotch bonnet chiles, kosher salt, toasted cumin seeds, EVOO, fresh sour orange juice, sherry wine vinegar and pepper. I couldn't find sour oranges, so the recipe said to use equal portions of lime and orange juice. Key West Motto is "Come As You Are"
Don't we all look like we are in the tropics? We felt it was still too chilly to wear tank tops and flip flops. You may have seen "THE TRAVELING TOTE" logo on my side bar. We are a group of five that are fond of the MacKenzie-Childs tote bags. Throughout the year, we will each write a connected post about the places our tote bags have taken us. They might include business trips, shopping adventures, weeklong vacations or simply every day escapades! My bag, Miss Aurora, begged to go to Key West in her dreams. She enjoyed it so much, that she had another dream about Key West. Miss MacKenzie Joy made her debut on 2/28/15 to celebrate birthdays with a group of friends at Zeina's. I don't leave the house without a tote bag. Just call me the BAG LADY. During the week, I have been known to use my bag like a brief case. Thanks for stopping by! I will be joining Between Naps on the Porch for Tablescape Thursday and Rattlebridge Farm for Foodie Friday. Had to say that first off..
You did a fantastic job and everyone must have felt so special..LOL one day there will be tiny feet running around and high chairs and booster seats..around that pretty table..That's when total decorum went out the door here..no more matching chairs.. so funny. Maybe you will be like Jaqueline though..and pull it off perfectly! You are a beautiful bunch. I see that Dinosaur book mentioned again..
Lucky you and Hobby Lobby! You aren't kidding about how tiny feet will change everything! We are already doing the unmatched chair thing but it works. It's not about the chairs, we know that. Love the cornbread from the Dinosaur BBQ...it's what our palette gets to used to and then there is no other for me. Very enjoyable to have a Hobby Lobby three miles from our home. The employees are the best! I'm in the kitchen today trying a couple more Key West recipes for our dinner group next Saturday. Looks like a fun party - great menu and decorations!! The color theme was so tropical! Hope you get to return to Key West soon- Miss Aurora need a vaca!! Miss Aurora did hint that she needs a vacation! Fantastic party! I know you are busy doing this again. I think it's a great idea! Your menu sounds delicious and the offerings make a perfect photo. I could use a tropical vacation with a bit of sand between my toes. 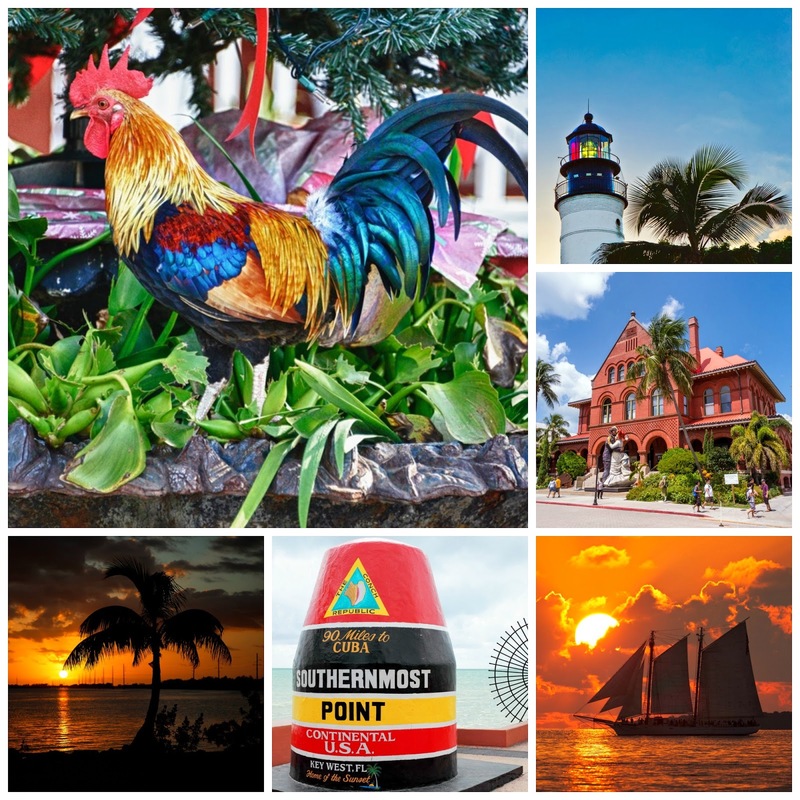 ;-) Love the photos of Key West. It's definitely a place on my list. Have a fun time with Miss Aurora! Sarah, we had so much fun hosting this Key West dinner for my family that we decided to host our dinner group this Saturday. It's been very tropical in my house! Oh Debbie, the Key West party looked like it was a hit! The menu sounded fabulous. Thanks for sharing a few of the recipes. Now I'm craving one of those key lime pie martinis! If it's as good as key lime pie, then I'm ready. 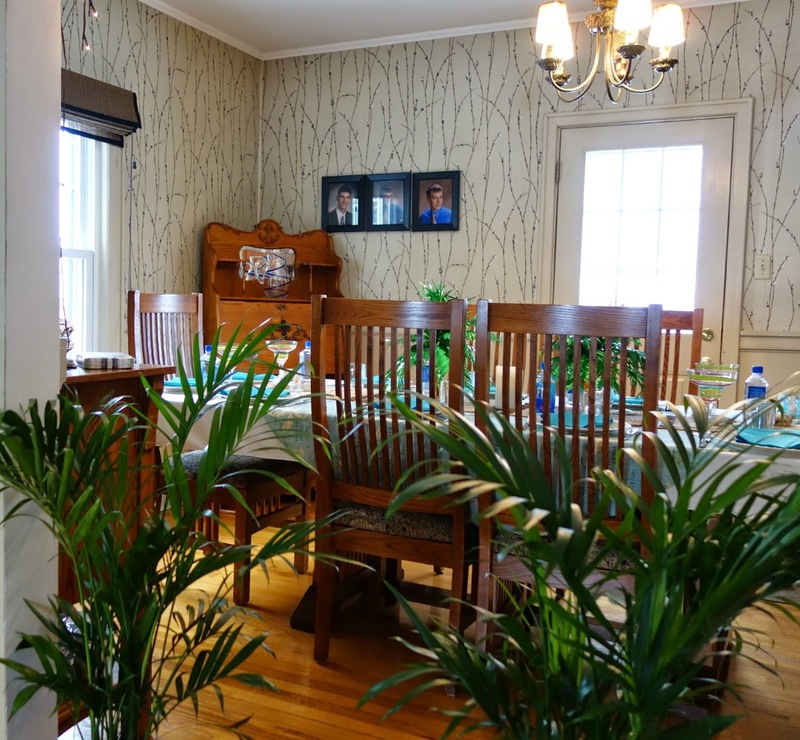 I loved the picture of your group and seeing all your fun decor. I'm looking forward to some escapades with Aurora and the rest of the traveling tote bags. What a fabulous blog post! I don't know where you get your abundance of energy and creativity, but I admire it! Having a tropical locale themed party this time of year sounds like just what the doc ordered to cure winter blues. Beautiful job, Deb. I love the new family photo. Your hair looks super cute too. Deb, I had been looking at the Key West cookbook for a year, and the timing was right so I put it in high gear and started planning the dinner. I find that if I have the passion for something, the energy flows. Thanks for stopping by! Enjoyed hearing about your party! All your themed touches and menu looked perfect. I really like how you set the table and how you even had the beach towel and palms as outside decor. That tote bag is great and how fun for you all to have named it! Thanks Lori! I popped over to your blog and saw your wonderful Easter display that I now want to make. Deb.....the pictures are great..looks like it was a big success. I cannot find the KeKe liquor anywhere around here....will keep looking... I think we are going to bring MaiTai's instead...that should get us thru the weekend! LOVE LOVE the tote! Might have to think about that for this years sale! In the meantime if the tote needs another vacation.....there could be a one way ticket down here to Endicott!! Hi Tami! I hope the barn sale has the tote. I think I know you well enough to say you will absolutely love, love, love it. Your friends must absolutely love you, Debbie! You are so creative. Your table, decor and meal all sound wonderful. Our next Gourmet (not hosted by us) will be a Florida-themed meal as well. The host and hostess have a condo in Florida and he is an avid fisherman. We will be lucky enough to eat what he catches. Delicious and fresh! I LOVE you tote, of course ;) Can't wait to see where the Traveling Totes go! Susan, I look forward to hearing about the Florida-themed meal! The Traveling Totes are currently on a winter rest, but traveling very soon. What a fun fun theme! I can't believe the snow - pretend it is the white sand beaches! Your tote is fabulous! How fun to be with a group of friends who also have the MC totes. Sounds like so much fun to take it along and tell us about it. Your menu sounds delicious. Now I am craving coconut shrimp. Great idea to pretend it is the white sand beaches! Hi Debbie - Your menu makes me hungry just looking at it. I've never been to Key West and it's on my list of places to see someday. I'm a big fan of Mackenzie Childs and have never seen that lovely bag. It's so perfect for travelling. What a fun family dinner! Made me wish I was part of Debbie's family. I'm definitely going to try a Key Lime Pie Martini. I'm afraid I may love that. Your table décor is perfect. I love that table topper and those bright blue napkins. Your menu sounds so wonderful, but I might not have made it past the KLP Martini table. Loving those striped stems too. 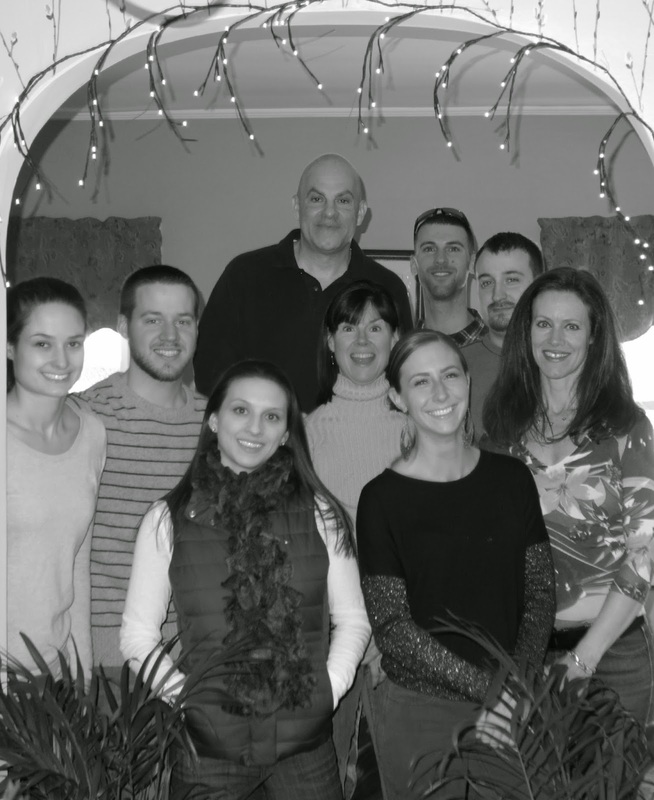 Good looking family. HI Debbie! Oh, how nice to be able to get with your family and looks like a wonderful time. I've been to Key West a few times! Pretty neat place. Oh, don't worry about commenting always on my blog. I'm jsut glad you pop in from time to time. What a stellar idea to have a Key West party in the middle of winter doldrums! We love love Key West, and have been there 3 times~wonderful laid back place with so many great restaurants and I could paint the houses and sunny quaint scenes all day long~ I would love a Key Lime Pie martini, never knew there was such a thing as Key Lime liqueur~yum! We make coconut shrimp often in the summer so next time I'll try your pineapple salsa, sounds divine! Everything looks delicious and love the travelin totes story! hahhaa...adorable post...and i love that tote,too. 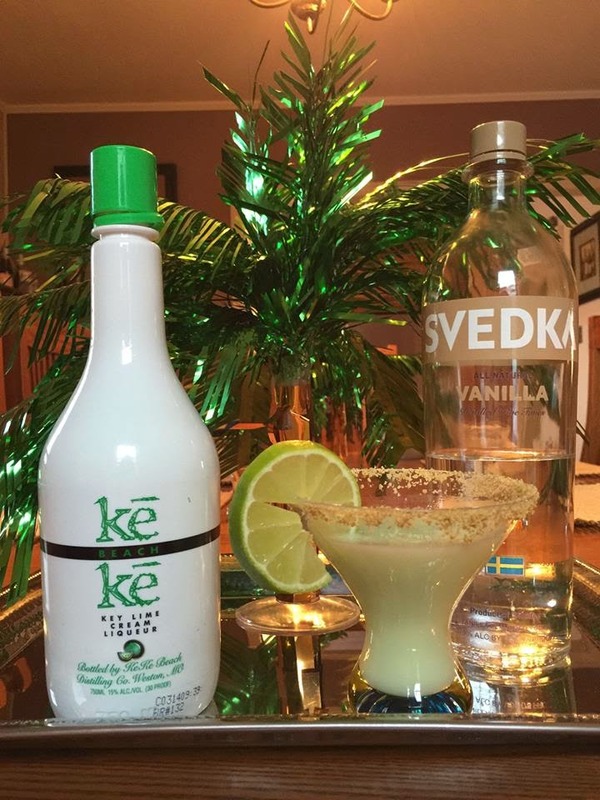 A key lime pie martini.....that I'm going to have to try. Your Key West theme certainly brightened winter chill and I'm guessing no one who enjoyed the dinner was in the doldrums. Looks like a fun party, great you did that for your family! Love the pork, I have never called that before. Is it the same as bone in center cut loin of pork? I'll ask my butcher and let you know :-) I'm glad you will join us with your bag. WOW. What a stunning header, what a stunning idea of being out in Key West Debbie! I see snow, and we too in Minneapolis will be getting it on Sunday! We just had an unusual Wednesday at 82. What is up with that! Popping over from Over 40 Bloggers. I live in central NY just north of Syracuse. Thankfully our snow has melted but now the rain has made everything muck. I love the themes party....what fun! Thanks for stopping by Donna! I love theme parties too. Since you are also in Central NY, you're probably just as excited as I am that we will be in the 70's by Monday.